I'm not sure what would be the decade equivalent of when Jon Smith was young, because technology and fashion evolve much slower in the Sims universe. I mean, look at the differences between 1960, 1985, and 2010 in real life and compare it to all the 25 year time jumps between each game! I try not to think about it too much so as not to break my brain, but for this decorative photo I went with a beatnik thing, because beatniks are cool. Jon is totally face 1, but I tried to off-set that by giving him really bushy eyebrows. Jennicor is *spoiler* based on the elf face template, and quite a looker in my opinion. Most skins make her nose look weirdly sharp edged and polygonal (I had the same problem with young Nina), but it looks fine with the Leh skins I'm using (see resource post). I really enjoy the attention to detail you put into your game. I've never even though to consider what decade the characters should embody. Not to mention skins and eyebrow templates and faces, lol. There must be so many details to remember and incorporate into your story, and you are doing a wonderful job of it. I love these little takes you do in between chapters. Yeah, it kinda breaks my brain, too. I do know someone who managed it - started with pioneerish and made it all the way to futuristic, but I never could keep all of it straight. Sims are very age-less for me, so I never give much thought to it (just think about how things look in sims 3 when it supposes to be years, if not generations before sims 2... it's pretty much the same lol), but of course it's a good storytelling tool and you're approaching it very nicely. I love your portraits! Both this pic and the Goth wedding in your last entry are amazing, so lively. Thanks! I hear you on the age thing. I've been applying real life years to my characters to keep track of time, and that makes Cassandra a preteen. I stretched her a little taller and have been trying to dress her in less kiddy clothes, but she still looks younger (and more flat-chested) than any of the 11-year-olds I've worked with. Late bloomer, I guess! I think I did an all right job aging Michael from early twenties to almost-thirty though. 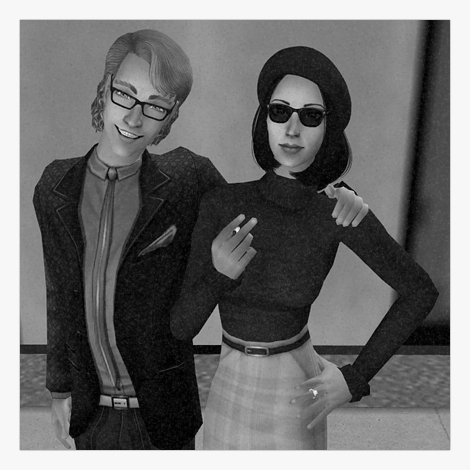 Oooh love the beatnik look on these two. Jon is really rockin' the hair and the eyebrows! I think of sims in an ageless type of way too, but I do like the use of clothes from different eras to illustrate different bits of personality. Looking forward to seeing how you work the Tricous into your story! The hair that you've used on Jon - that's a sims 2 store hair, right? Do you know where I could find it online? I've been searching for it everywhere, it's been driving me nuts! Yep, it's from the Art Noveaulicious collection. You can find it here, but if any of those links aren't working it would also be over at More Awesome Than You. This is a very cool picture! I've never really given much thought to the decades the characters are in but I have thought about the time in passing because everyone always has a television and such. I love what you did with this!